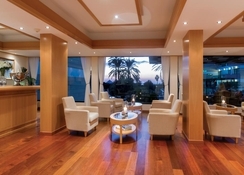 Constantinou Bros Asimina Suites Hotel provides its guests with a luxury experience from start to finish. With an airport transfer time of just 20-minutes, you can begin your holiday in no time. 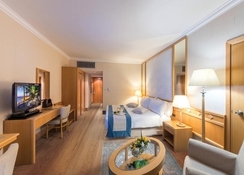 A great family-friendly hotel, Constantinou Bros Asimina Suites Hotel is also ideal for couples on a romantic getaway. Honeymooners can take advantage of the special couple’s spa package and enjoy an intimate meal along the pier. 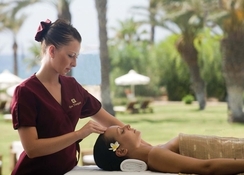 The luxury spa offers a whole host of therapies from massage to hydrotherapy as well as sauna and steam baths. There are four restaurants on site each offering a delicious selection of finely cooked international and more local Mediterranean dishes. The main restaurant has theme nights and exciting show cooking. Head out into Paphos itself and you will be able to hit up waterparks, learn about the deep cultural heritage at the historic sites and museums and relax on the warm golden sands of the nearby beaches. Paphos International Airport lies just 10km from the hotel with transfer time under 20-minutes. The beachfront location of Constantinou Bros Asimina Suites Hotel puts it within easy access to the beach. 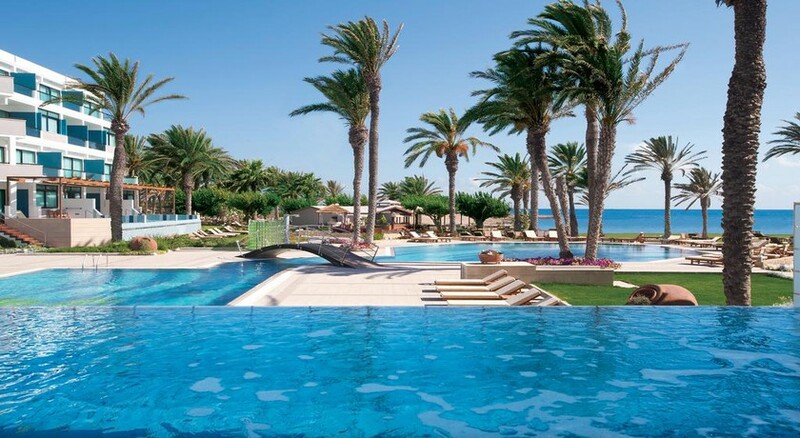 Guests will find two waterparks just two-minutes’ walk from the hotel, Paphos Waterpark and Paphos Luna Park. Historic sites such as the Paphos Archaeological Park and Medieval Castle are just a 10-minute drive north of the hotel. There are many restaurants and bars to be found along the main road of Poseidonos less than a mile away. Rooms at Constantinou Bros Asimina Suites Hotel are elegantly designed with a combination of beautiful furniture and neutral colour tones. You’ll find all the basic amenities you’ll need for a comfortable stay such as air-conditioning, tea and coffee making facilities, T.V., wi-fi and much more besides. There are several room types you can choose from. Junior suites sleep up to three people and feature a comfortable living area. One-bedroom and Superior one-bedroom suites are equipped with the same high-quality features as the junior suite but some with a larger living area separated from the rest of the room. For something extra special the Executive suite features a private pool and jacuzzi. Your luxury stay extends to the fine food and drinks available at Constantinou Bros Asimina Suites Hotel. Estia Restaurant provides international and local cuisine with a buffet breakfast. It also has show cooking and theme nights. 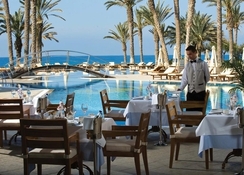 The Pool Restaurant serve slight meals and an a la carte lunch in an al fresco dining area. Kymata Restaurant offers guests a Mediterranean a la carte menu with stunning views over the sea, however, reservations are required. In addition, there are three bars, the lounge bar, VIPs’ bar and the sports bar with pool tables and a big screen TV. Around the hotel are a host of bars serving refreshing drinks with great views over the sea and restaurants that cater to a wide variety of tastes such as Chinese, Mexican and seafood as well as tavernas local favourites. Couples will love to take advantage of a romantic meal for two at the pier providing an intimate setting. Take a load off at the Elixir Spa which offers a comprehensive range of ways to unwind including therapeutic massage, aromatherapy, steam bath, hydrotherapy and much more. There are also special honeymoon spa packages. A 10-minute drive into central Paphos will offer visitors more great ways to enjoy their holiday, whether that’s absorbing culture and history at the Paphos Archaeological Park or Paphos District Museum, visiting the folk art museum or getting wet and wild with family fun at one of the waterparks. Those who want to party the night away will find a number of nightclubs nearby. Smart casual clothes required for dinner. Long trousers required for men.